Currently, I have to work on a Windows (specifically, Windows 10) system for two Ruby on Rails projects with different version. Also, the said system is fresh and there wasn't any existing rails installed yet. Previously, I use InstantRails for Windows installment but, correct me if I am wrong, this method is long gone supported and isn't used anymore. 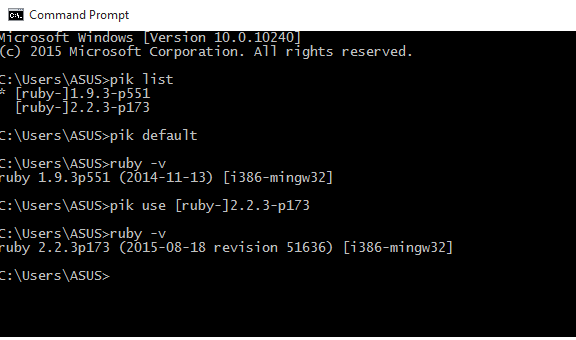 So what I'm after right now is to use something similar to RVM (rbenv) which is easy to install on Windows and here is where PIK comes in. As mentioned, operating system is Windows 10 (64-bit). For my RoR, what I'll be needing are versions Rails 3.2 and 4.2. Both uses MySQL 5.5.x. Though I won't be discussing as to how to set this up. I usually just use a WAMP for this matter. Steps on installing should be pretty straightforward with its installation wizard. Next is to download Pik from github. As of this writing, the latest version is Pik-0.3.0. 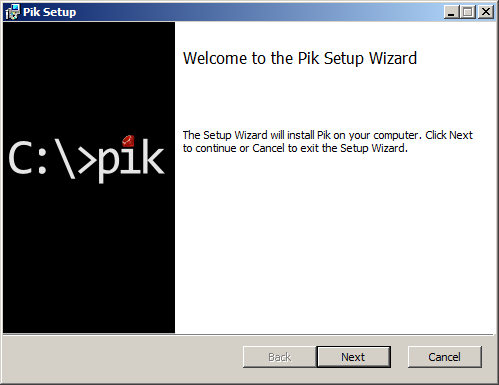 NOTE: Pik, as of 2012, is no longer maintained but as of my test this should still work and so far the easiest, from what I have tried, to install. That's it! Use ruby -v to check the version. Again as of this writing, Pik is no longer maintained by its author but from what I have tried, this one is the easiest to follow and install. If there is a newer method or easier process to do this, just put it in the comments below and I'll try it.